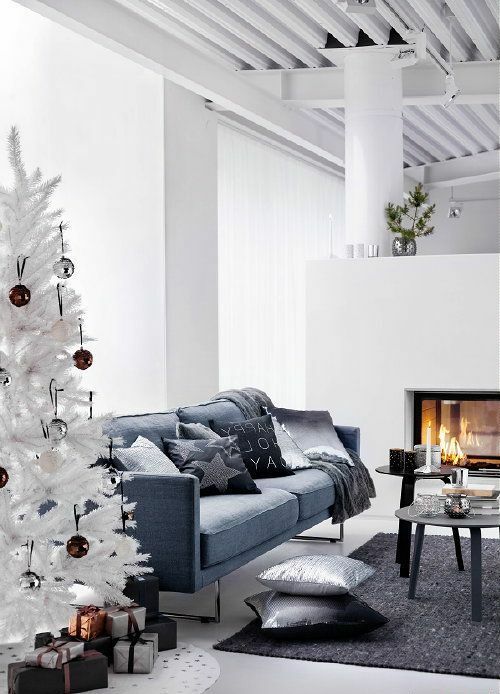 When it comes to decorating the home for Christmas, you have a wide range of options, like tradition, modern, beachy and much more. 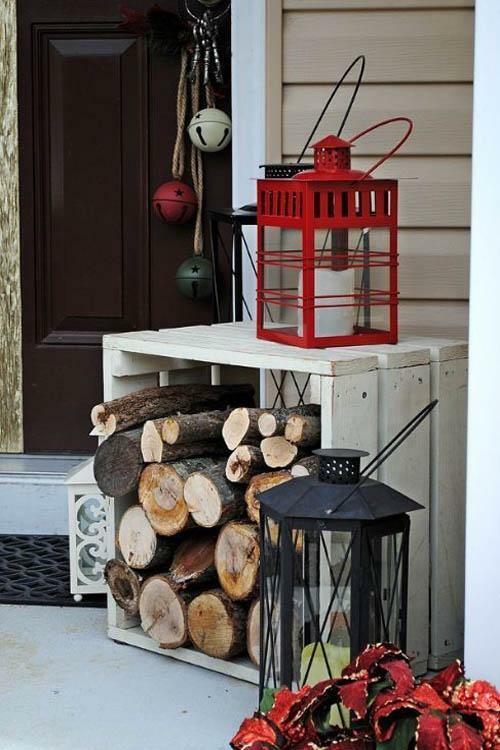 What do you think about giving your house a rustic decoration? After all, what could be better than giving an old-fashioned look to your home, so unlike the typical decorations you get to see these days. 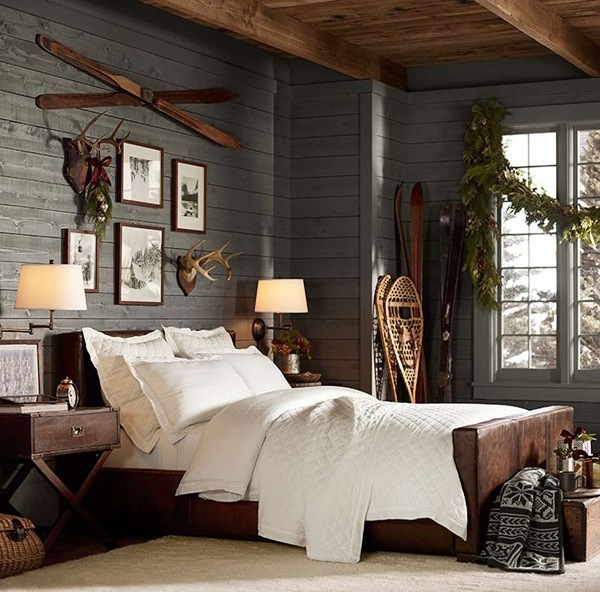 Rustic décor gives a cozy and inviting feeling, which we all need to relax on a chilly winter day. 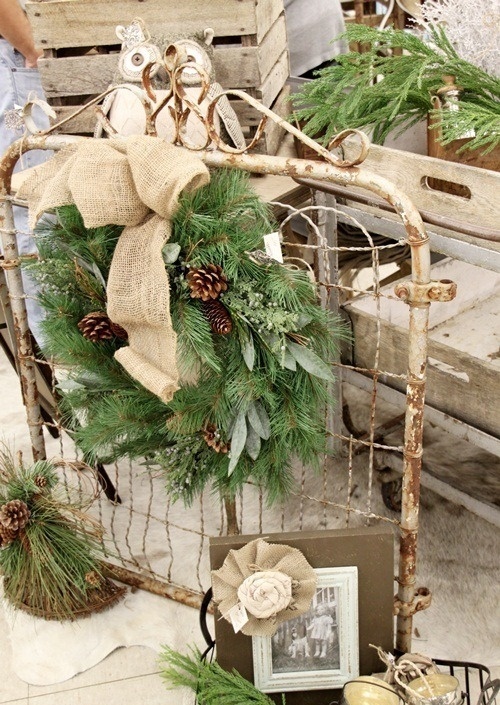 Below, we’ve got you a comprehensive list of rustic decorating ideas for you. 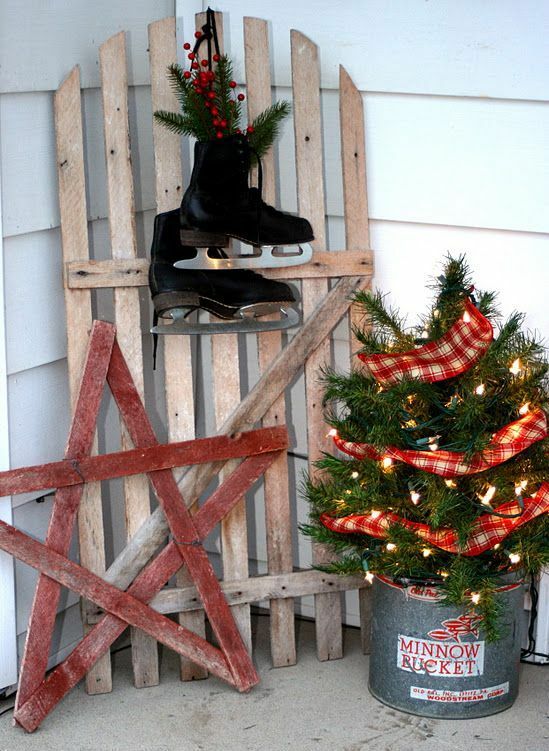 For outdoor decoration, you can use an old, slightly worn out sled. 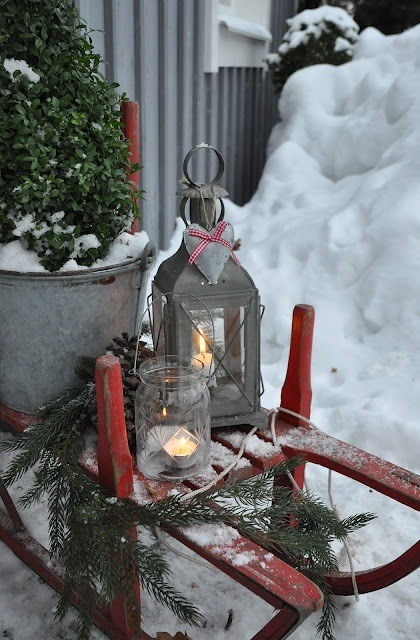 Put a galvanized bucket filled with snow and greenery, a lantern and a tea light candle in a mason jar. This living room is a perfect mix of rustic and modern. White the red and white setting is thoroughly modern, the wooden coffee table is presenting a different ballgame altogether. What are the two bears doing on the Christmas tree? Don’t worry! Those are not real bears. 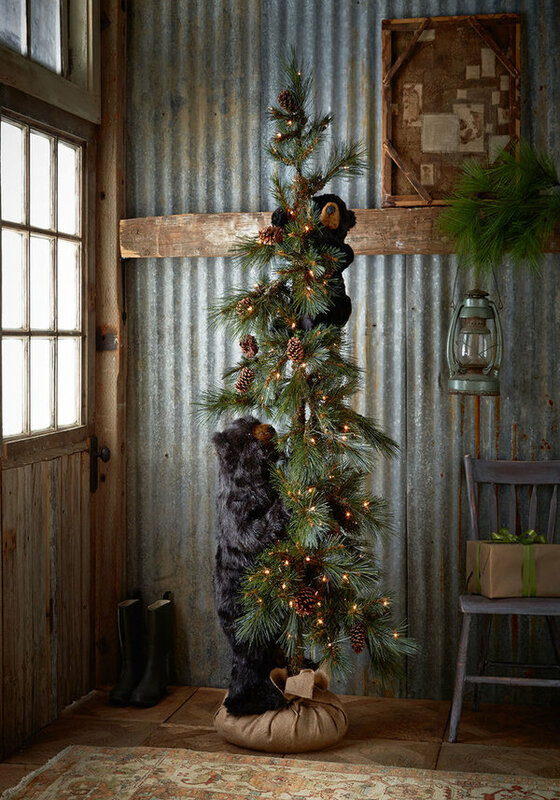 Faux bears are attached to the trees to give is a rustic look. When you’re organizing a rustic Christmas tree, you have to take care about Santa Claus also. 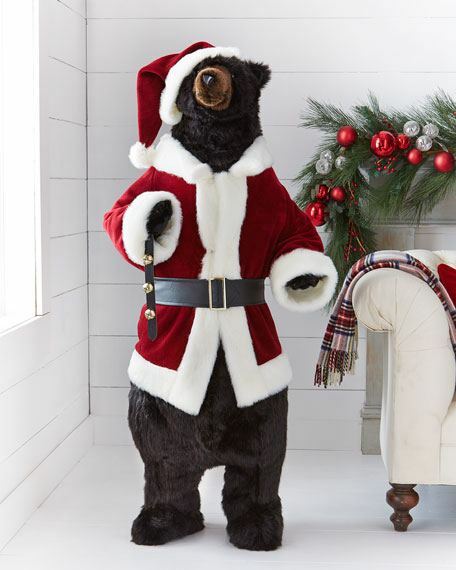 So place this black bear Santa to give a different look to the house. Just ensure the kids don’t freak out. 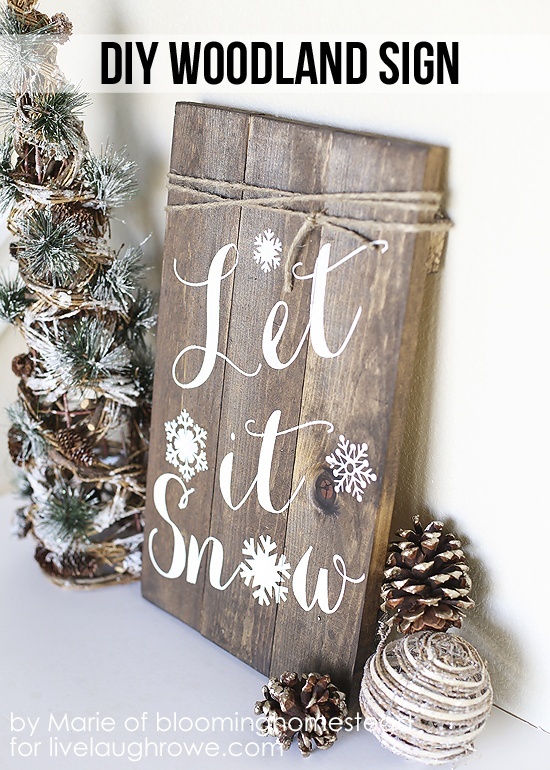 This Let It Snow sign will complement your rustic decoration really very well. 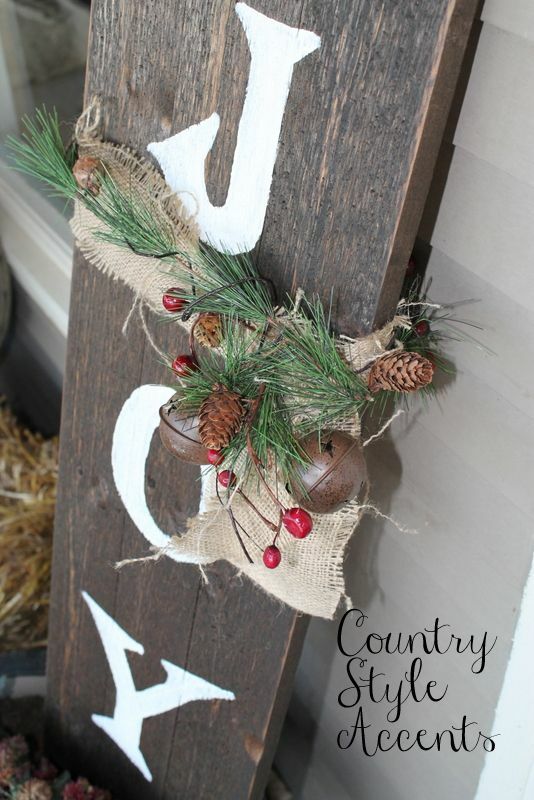 You can place this wooden sign near the front door or rustic to give a rustic look to your house. 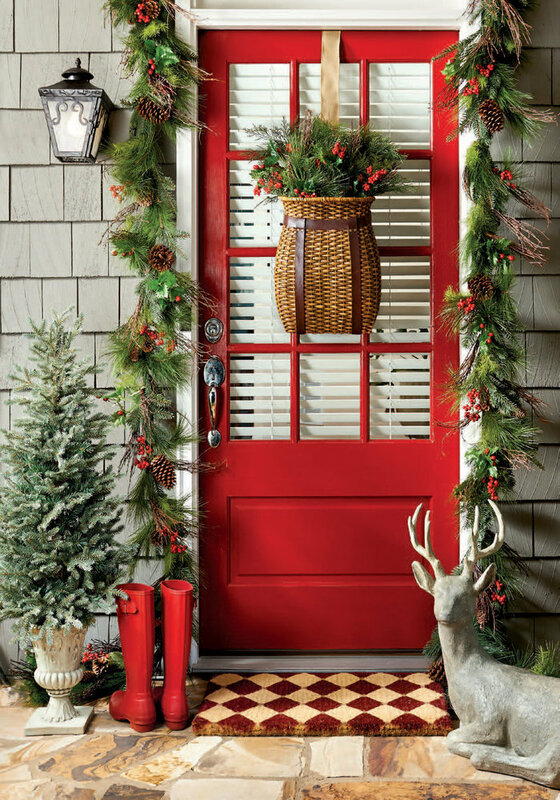 Here’s a lovely way to decorate the entrance for the holidays. 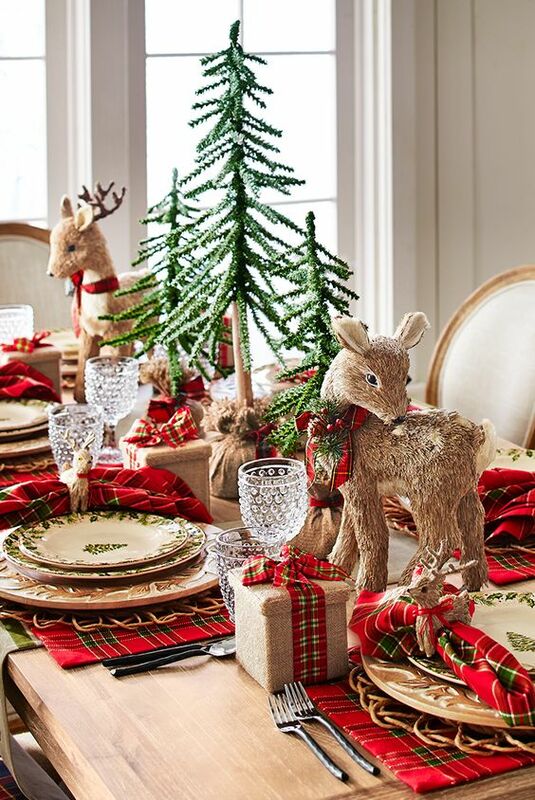 It has all the elements you need to create a rustic décor- pinecones, reindeer, cranberries, Santa shoes and a basket. 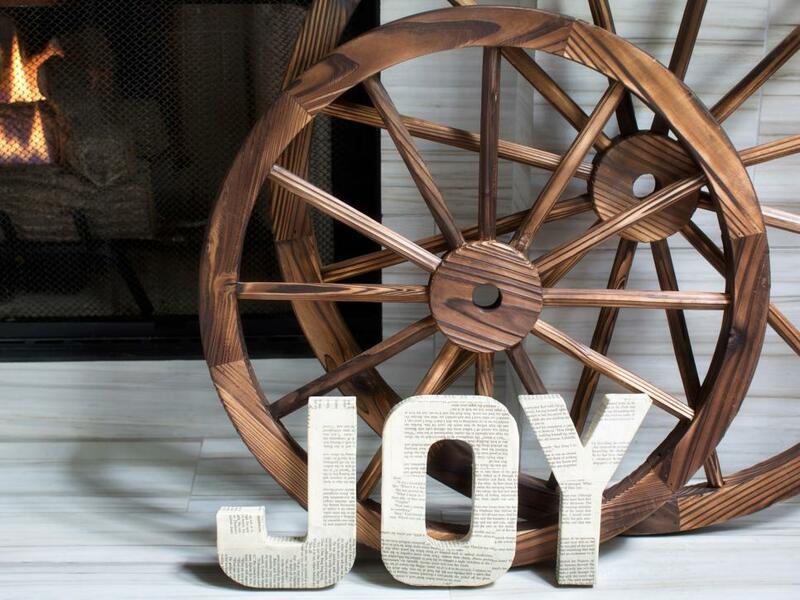 Give a fresh touch to your wagon wheel and newspaper this Christmas by making a holiday message out of it. Even the decoration has been done very intelligently. 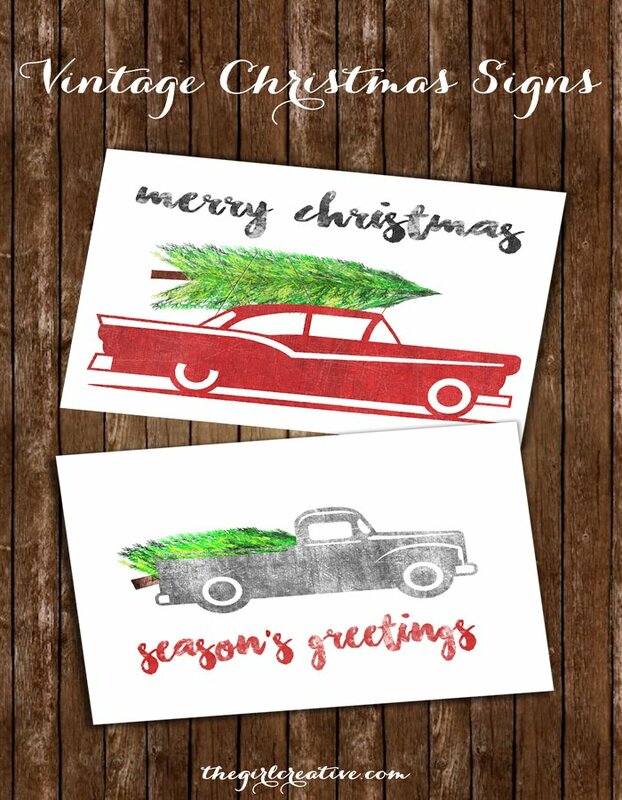 Here’s a simple rustic and vintage Christmas sign that even kids can make. Print out the pages and have the children paint the cards. Ask them to stick to a wooden surface. 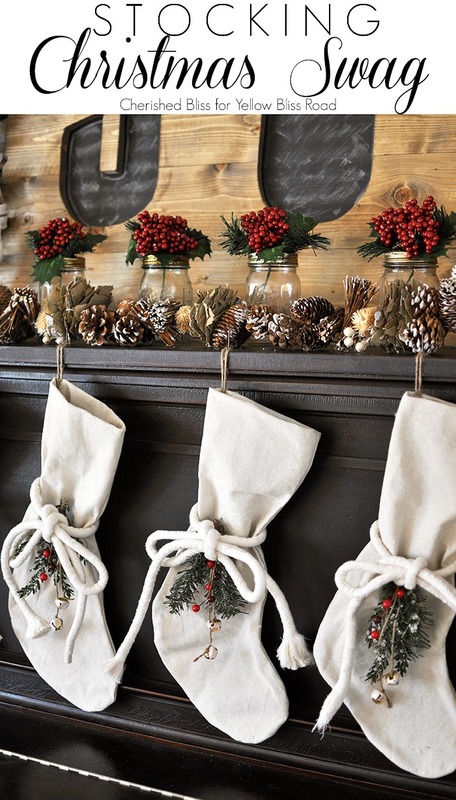 These rustic styled stockings will make a perfect addition to your mantel. You can find complete instructions at yellowblissroad.com. This is an easy DIY which you can do to beautify your house during Christmas. 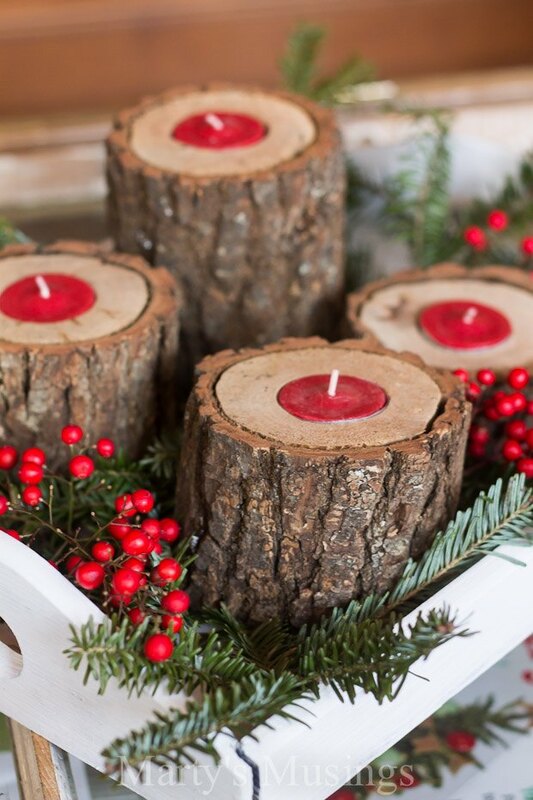 Take small sized logs, drill holes in them and place the tea light candles. These candles will look stunning on the dinner and coffee table. Now this is one helluva rustic design. The JOY sign has been placed strategically on the stairs. The banister is lined with dried evergreen garland and burlap. 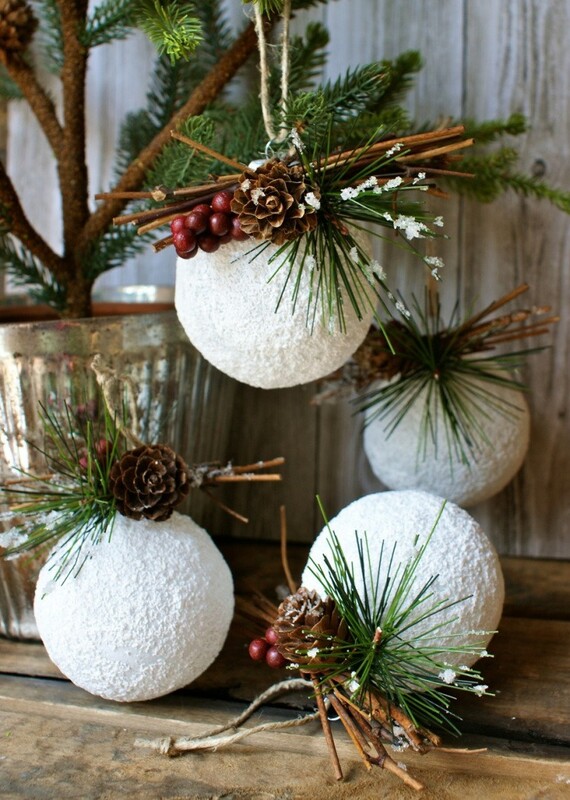 These white Christmas ornaments, complete with twigs, berries, pine leaves and pinecones would make an excellent addition to your rustic Christmas tree. One of the most unique door decoration ideas we’ve come across in the recent times. Just gather a few twigs and a branch from the backyard and get started. 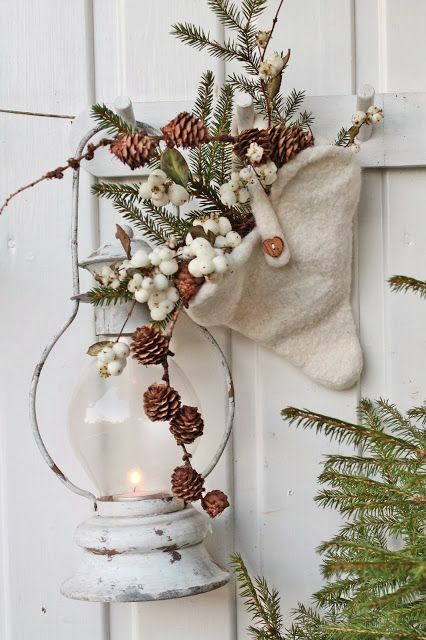 This is such as innovative rustic Christmas decoration idea. You’re sure to have a warm and delightful dinner from it. 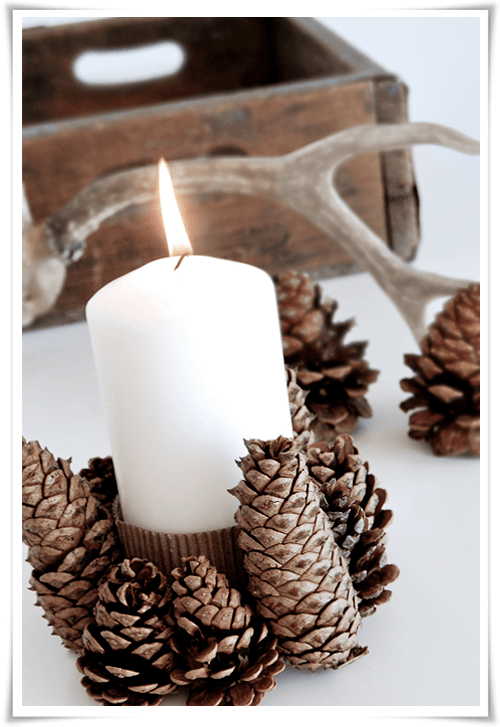 Here’s a lovely twist to traditional Christmas candles. These gorgeous candles are very easy to make and will give an elegant touch to your table. What more? They’re inexpensive too! 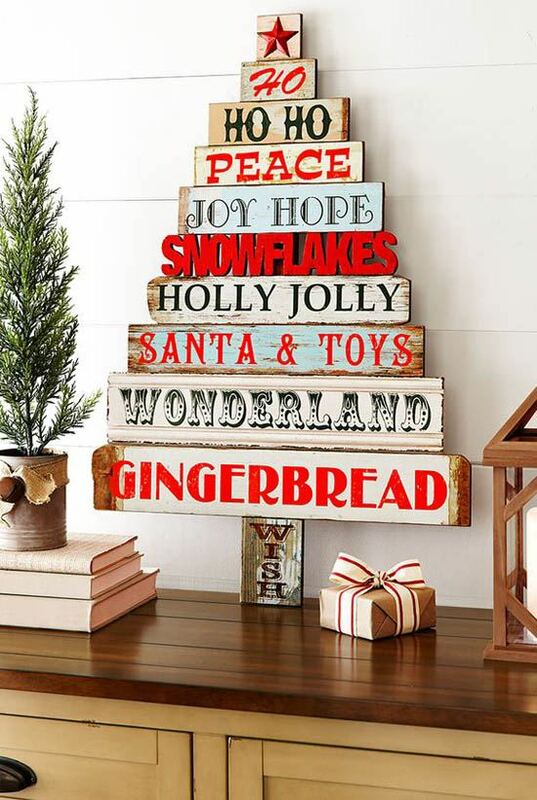 This wooden tree has all the keywords of Christmas. We give it a thumbs up! Here’s an excellent way to give a modern and rustic look to your house. 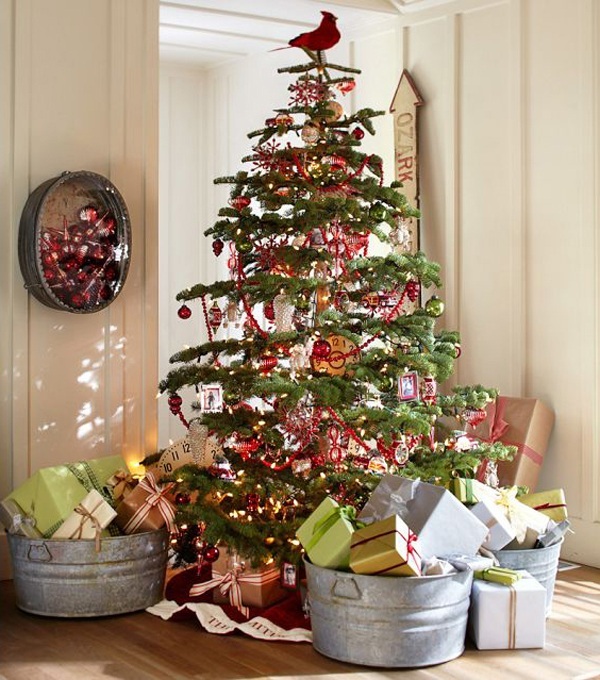 Instead of stacking the gifts near the tree, stuff them in aluminum buckets and put on display. 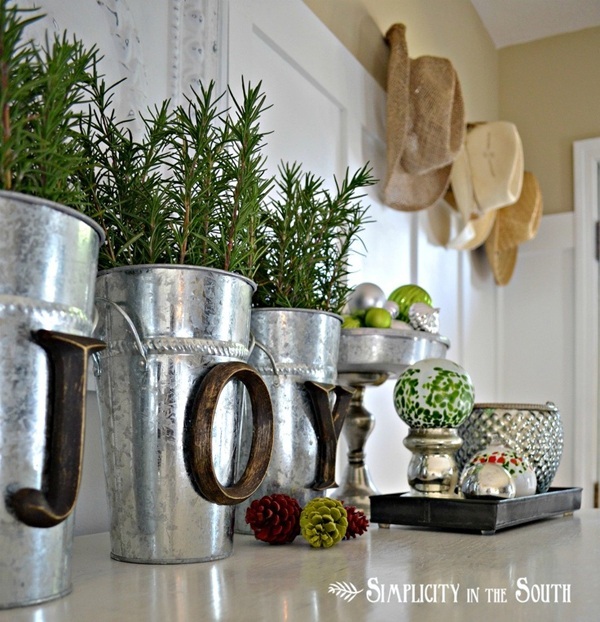 Give your mantelpiece a makeover by placing galvanized buckets with JOY sign on it. Painted pinecones are also a welcome addition. This is one of the most unique Christmas door decoration ideas we’ve seen in a long top. A felt cap is filled with pinecones, pine leaves, and cotton buds. A white lantern also hangs from the door. This has to be the most perfect exhibition of a rustic living room. 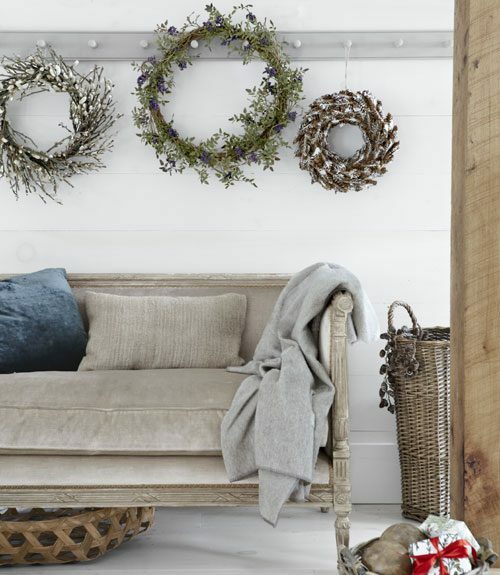 The color combination of gray, white and white is perfect to create a rustic look. And the wreaths are also adding a perfect look. The logs arranged in this porch is giving us a warm and fuzzy feeling. 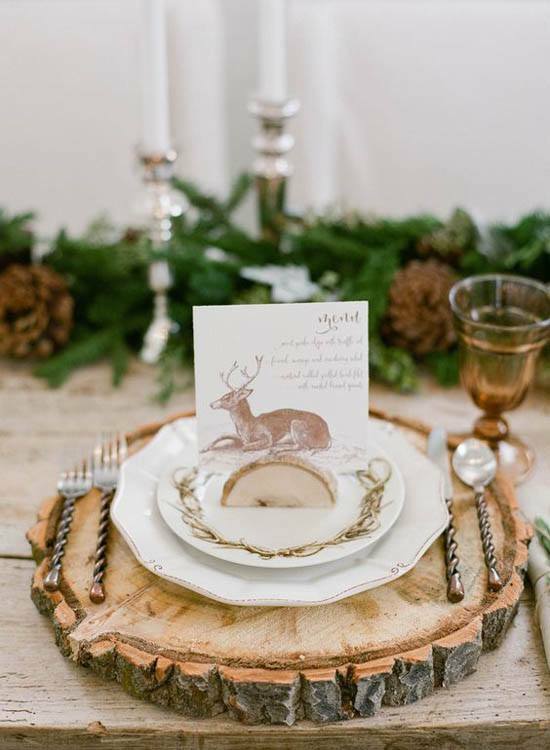 With the baby reindeer and wooden tableware, this table decoration isn’t just giving a rustic, but also a thorough festive look. 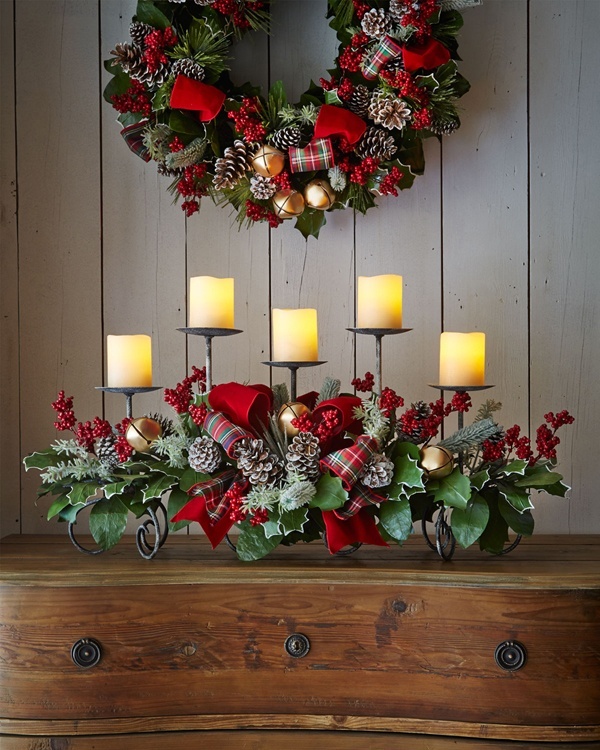 Give an evergreen wreath a rustic makeover by adding plaid ribbons, jingle bells, and pinecones on it. 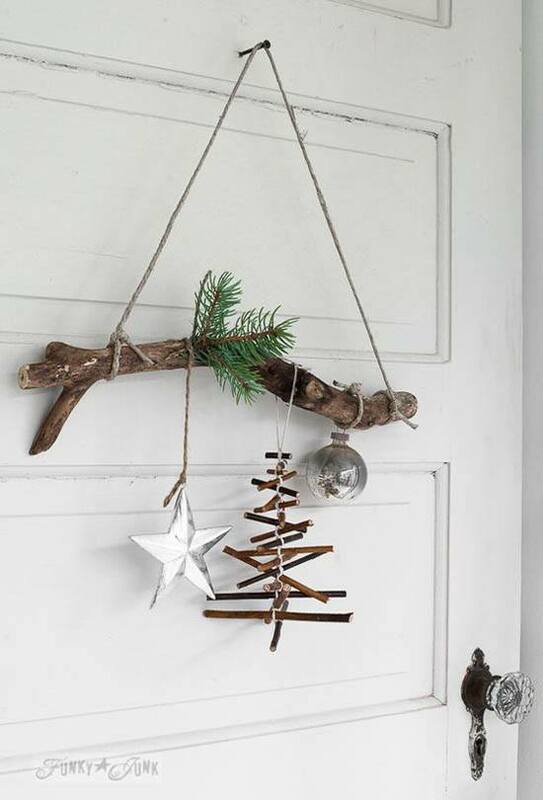 Here’s a perfect rustic decoration for you to follow. A portable Christmas tree is decorated with string lights and plaid ribbon. You also have a sled and wooden star and of course, ice skating boots. Another excellent JOY sign for you to try out. 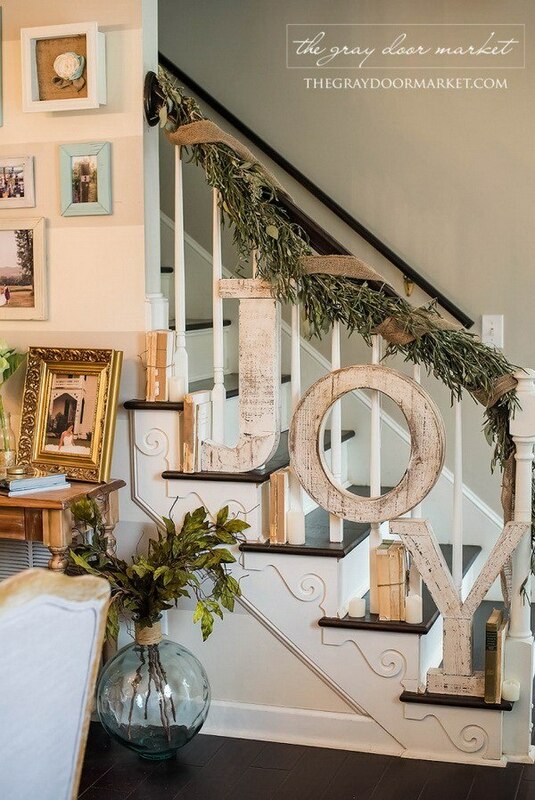 It’s a relatively simple one, with the word JOY written on a wooden plank and decorated with a burlap, bells, cranberries and pine cones. This has to be the most distinctive bedroom decoration for Christmas. Everything is arranged very neatly here along the rustic lines. 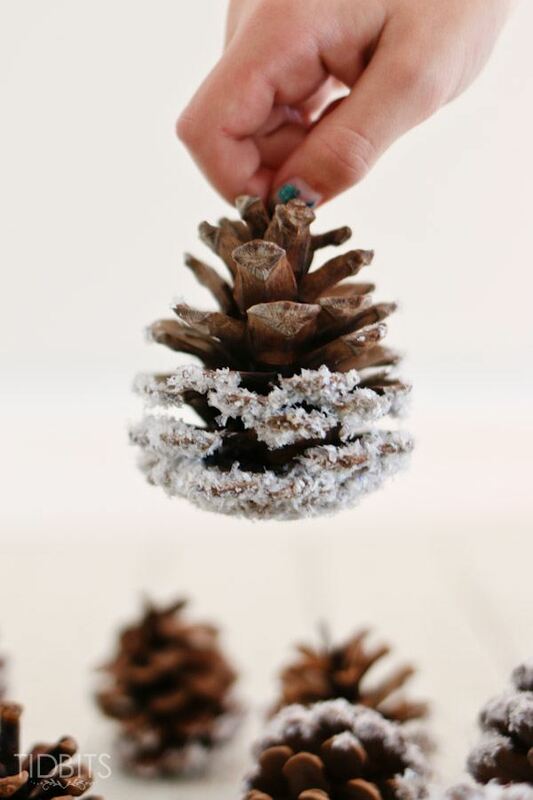 Add a rustic and elegant charm to your decoration with these beautiful snow covered pinecones. 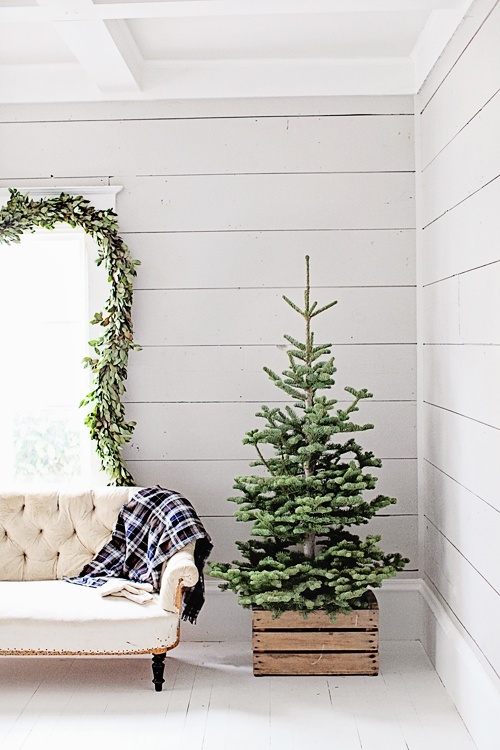 Use a wooden crate as your tree holder to give it a rustic look. We didn’t know worn out could look so beautiful! The blogger here has used a wrought iron to hang the Christmas wreath on it. 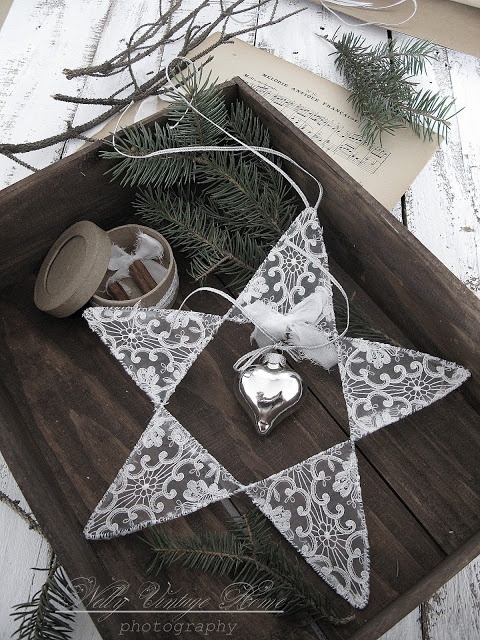 If you’re having a Christmas wedding and want to give some rustic touches to it, you can try this lovely idea. 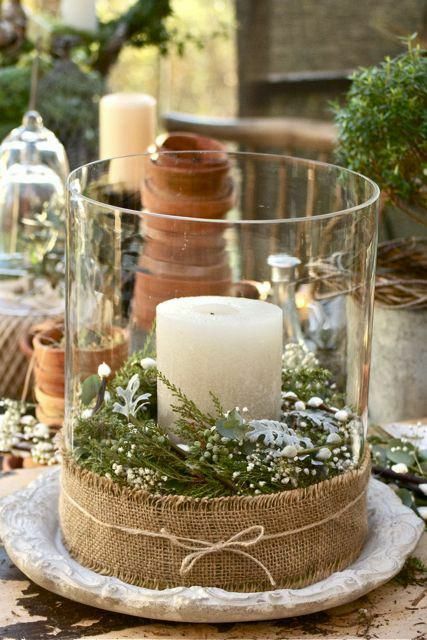 A pillar candle is placed in a transparent jar filled with greenery and then tied with a burlap and twine.